Am Samstag, den 14. April finden um 20:00 Uhr Profikämpfe statt. Als Hauptkampf boxt Arnold "The Cobra" Gjergjaj seinen 16. Profikampf. Am Sonntag, den 15. 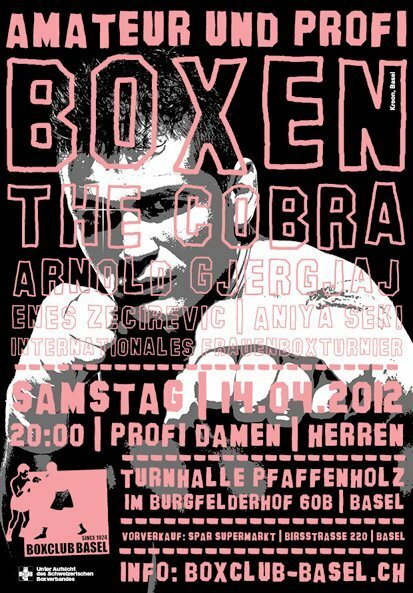 April boxen Hoseyn Shahidi und Kadri Gashi in der Pfaffenhalle in Basel. Wir wünschen ihnen auch hier wieder viel Erfolg. I don't even know how I ended up right here, but I believed this publish was once great. I do not understand who you are but certainly you are going to a famous blogger for those who are not already. Cheers!